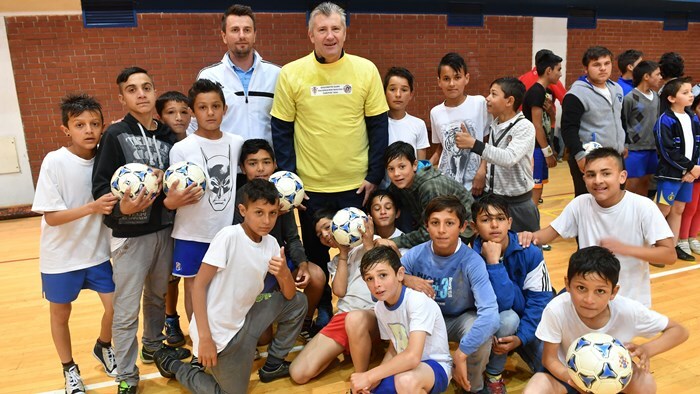 The fifth National Minorities Football Camp was held in Čakovec, with Croatian Football Federation president Davor Šuker among the attending dignitaries. On Tuesday, Čakovec hosted the fifth National Minorities Football Camp, opened by HNS president Davor Šuker. His senior consultant Zorislav Srebrić, HNS Executive Committee member Stjepan Merkaš, Croatia president emissary Nenad Horvatić, Međimurje County Football Federation president Mato Kljajić, Međimurje County prefect Matija Posavec, Varaždin County Football Federation secretary Ivan Novak, and Croatia national team coaching staff member Marjan Mrmić also attended the event. Approximately 160 boys and girls, aged 7 - 16, participated in the activities. In his opening speech, HNS president Šuker was especially pleased with a significant number of participating girls, since the Croatian Football Federation tries to improve women's football. "I would like to congratulate my good friend Toti Dedić, all of my friends who contribute to national minorities struggle for a better place in society. HNS, UEFA, and FIFA will always hold quality relations with minorities, since we are aware of the importance of raising a child, good manners, football, and the key - a sound mind in a healthy body. I hope the training session will be a good one, and I believe that some of these kids will become a First Division players, maybe even a national team players". "The easiest path to tolerance is to assist each kid in sports. We have to help each other, stay together, provide footballs, and teach them discipline. It is important that kids acquire the virtues of athletes, to acquire the elements crucial for life and work", added Šuker. His recollections included his beginnings in Osijek. "The school tournaments meant everything to us. We lived with football. We didn't have much, but NK Osijek gave us all we needed - work ethics and discipline". "As society, we have to be more realistic, and more tolerant. We have act as humans towards everyone, and respect differences. The only thing a kid wants is how to get a football and how to play football. 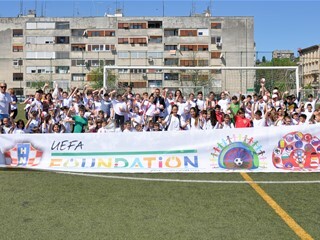 With assistance from UEFA, HNS will always support these camps. This is the fifth, and I hope there are plenty more to come. Our duty, as well as the duty of County Football Federations, is to set aside financial means to provide the children with the basics. They will develop, and their happiness is the key. Their smile can't be bought, and is worth a lot", said Šuker. Šuker, the proud owner of honorary Roma Certificate of Citizenship, emphasized that HNS is the first football federation in the world that organizes national minorities camp. He believes that others will follow this example. "Both girls and boys play football and I would like to raise the girls' level of interest for football even more. We have quality women's clubs, a quality league, ŽNK Osijek in the Champions League, and Women's Football Festivals. As the UEFA Executive Committee member, on Thursday I will attend the Women's Champions League final, and that will be a beautiful experience. I would like to push a button and move the limits of women's football in Croatia, but that is a long-term project. I believe that women's football will improve, since much has already been done", concluded Šuker.